Dr. Kara Ramsey was born and raised in western Pennsylvania in the small town of Hermitage. After graduating from the New England College of Optometry, she relocated to Apex, North Carolina in 2009. She currently lives in Apex with her daughter Amelia. 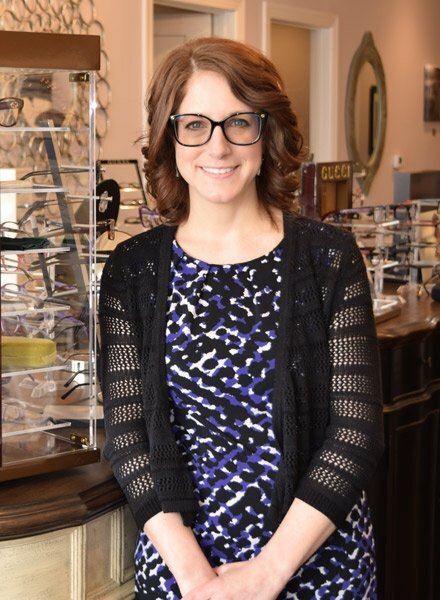 As an eye doctor, she is proud to be a part of the Apex /Cary community and enjoys helping families with their visual needs. Dr. Ramsey loves seeing patients of all ages, from infants to seniors. She enjoys taking time to listen to her patients to help develop a better understanding of their lifestyle. With this information, she creates custom recommendations for her patient’s visual needs for the comfort, health, and long term protection of their eyes. She is interested in nutrition and proactively preventing ocular disease through health and lifestyle choices, with special attention to diabetes, glaucoma, and macular degeneration. She also works with specialty contact lenses including astigmatism, multifocal, scleral, and Rigid Gas Permeable (RGP) options. During her rotations in optometry school, she worked at the internationally-acclaimed Perkins School for the Blind, School of Helen Keller. Since this time, she has had a focus on helping patients with low vision improve their functional abilities. With her knowledge of low vision devices, she enjoys helping those with severe difficulties seeing improve their daily lives. Dr. Ramsey is an enthusiastic volunteer and in 2011, she established a vision clinic with the Raleigh Rescue Mission which provides services for Raleigh’s homeless community. She has given comprehensive eye exams and full ocular health evaluations to hundreds of those in need in our community. EyeCare for You provides free eye care and glasses in support of this much needed mission. Dr. Ramsey continues to volunteer for the Raleigh Rescue Mission regularly, seeing patients from the mission on a monthly basis. She is also an advocate for those with vision needs abroad. Since the devastating earthquake in 2010, she has been on several mission trips to Haiti to provide eye exams and glasses to rural Haitians. During each week-long trip, her team provides over 1,500 eye exams and dispenses over 2,000 pairs of glasses to those without access to regular eye care. She has plans for another mission trip to Haiti in 2019. She has been a member of both the American Optometric Association and the North Carolina Optometric Association since 2009. When she is not examining eyes and enjoying her time at the office, she loves spending time with Amelia, running, reading, and traveling.